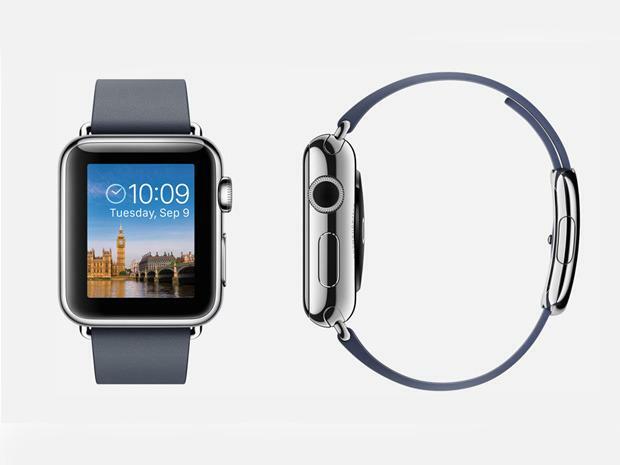 Apple Watch: No wrist-based wearable has received as much attention as the forthcoming Apple Watch. TIME magazine recently proclaimed it one of the best 25 inventions of 2014 because "it wholly reimagines the computer for the wrist, using a novel interface that combines a touchscreen and physical buttons." Apple's recently released WatchKit for developers provides a rough idea of what Watch apps will be like, including a "glances" feature (for short bits of info) and "actionable notifications" that let users "take action right from their wrists." Big questions remain, though. Exactly when will the Watch be released? Apple says "early 2015;" other rumors suggest "spring." Just how much will those fancy deluxe models cost? Some reports say as much as $US1200, though low-end models should start at $US350. Swatch, a Swiss company know for creating timepieces with vibrant hues, plans to launch a smartwatch in the next three months. The Internet-connected device will work with Android and Windows software and allow users to make mobile payments, Swatch CEO Nick Hayek told Bloomberg Business on Thursday. Hayek didn't offer additional details such as how much it will cost and how the device will interface with Android and Windows software. Swatch didn't immediately reply to a request for comment. Swatch's entry into the wearable and mobile payment market comes as Apple prepares to launch its first smartwatch (pictured) and expands its mobile wallet product. The Apple Watch, which will debut in April, will have fitness-tracking features and offer applications for text messaging, emails and getting directions. Apple entered the mobile payment space in October with Apple Pay. Swatch's decision to develop a smartwatch indicates that Hayek has done an about-face on wearables. Two years ago he downplayed the impact smartwatches would have on the watch industry, saying they wouldn't be as revolutionary as predicted. Last year he said Swatch wouldn't develop such devices because of consumer reluctance. He had questioned how small watch screens could be used for communicating and the amount of charging smartwatches would require. Hayek told Bloomberg that some of the products Swatch plans to launch this year will reflect the record number of patent applications it filed in 2014. Some of those patents cover batteries that use materials that can boost performance, Hayek said. The Swatch smartwatch will connect to the Internet "without having to be charged," he told Bloomberg. Switzerland's two largest retailers will let customers make payments with Swatch's smartwatch and the company is talking to other retailers about using the payment system. Another traditional watchmaker getting into the wearables space is TAG Heuer, which is looking to release a smartwatch this year that features GPS and health monitoring functions. High-end consumer product company Montblanc sells a smart watchband for its timepieces that tracks activities, among other features, and uses Bluetooth to connect to mobile devices running iOS and Android.